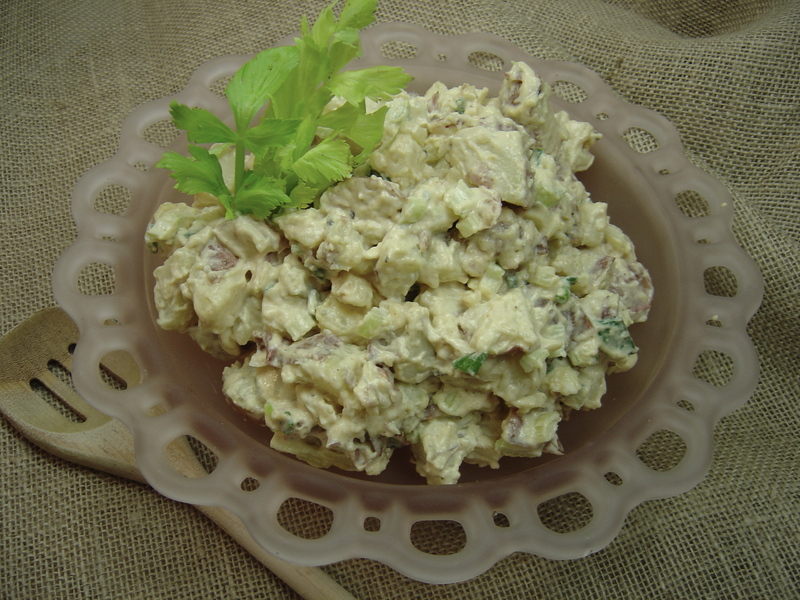 A simple and zippy potato salad that is sure to become a favorite! Every once in awhile I come across something that I wonder why I never made myself. Case in point is the Buffalo Potato Salad sold in the deli by Dorothy Lane Markets of Dayton Ohio. I had grabbed some when I was in a hurry, late for dinner, and needed a quick side. But OUCH! At somewhere around $9 per pound, something had to be done about the price gouging. Much cheaper to make this yourself. Boil potatoes in salted water until fork-tender, about 15-20 minutes; drain. Chop potatoes coarsely, quarter, or halve, depending on size. Place potatoes in a salad bowl with scallions, celery, crumbled bacon, and crumbled Roquefort cheese. Whisk together the hot sauce with the mayo; and season the dressing to taste with salt and pepper. I use a Crystal or Frank’s type hot sauce in this, not Tabasco. Generally you want to use the kind of hot sauce you prefer on your hot wings. Gently stir the dressing into the potatoes to mix. Garnish with paprika. Refrigerate for a few hours for flavors to blend; if you hold it for long periods before serving, you may need a bit more hot sauce as it tends to tone down upon sitting, but it is easy to stir in a little more to taste. This is wonderful served with a typical summer barbecue. 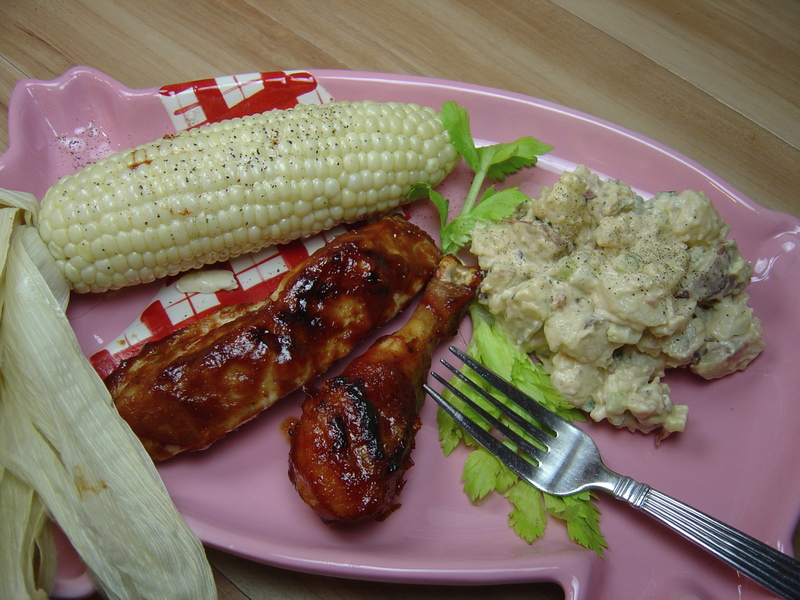 Here it is shown with bbq chicken drummies, bbq boneless country style pork ribs, and oven roasted corn on the cob.